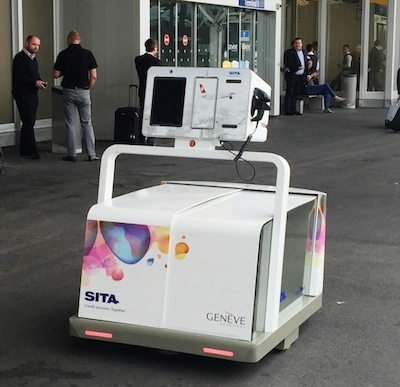 Recently, passengers arriving at Geneva Airport received help with their bag drop from Leo, an innovative baggage robot developed by air transport IT provider SITA, which is being trialed outside the airport’s Terminal 1. Leo – named after the Italian Renaissance inventor and engineer Leonardo da Vinci who built what is now recognized as the world’s first robot – comes to the assistance of passengers as they approach the terminal building. Touching Leo’s Scan&Fly bag drop interface opens the baggage compartment doors to allow passengers to place their bags inside. Once passengers have scanned their boarding passes, the tags are printed and can be attached to the bag. With the bags loaded and tagged, the compartment door closes and Leo displays the boarding gate and departure time. Leo then takes the bags directly to the baggage handling area where they are sorted and connected to the correct flight. Using robots such as Leo means that in future fewer bags and trolleys will enter the airport terminal, reducing congestion and making airport navigation easier.